I took this photograph on the same early morning shoot as the images in the previous two posts. 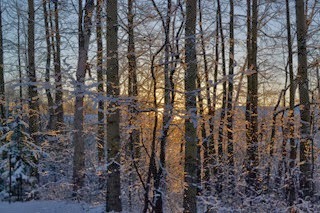 Here the golden early morning sunlight silhouettes the trunks of a mixed grove of birch, poplar, alder, willow, spruce and red osier dogwood. 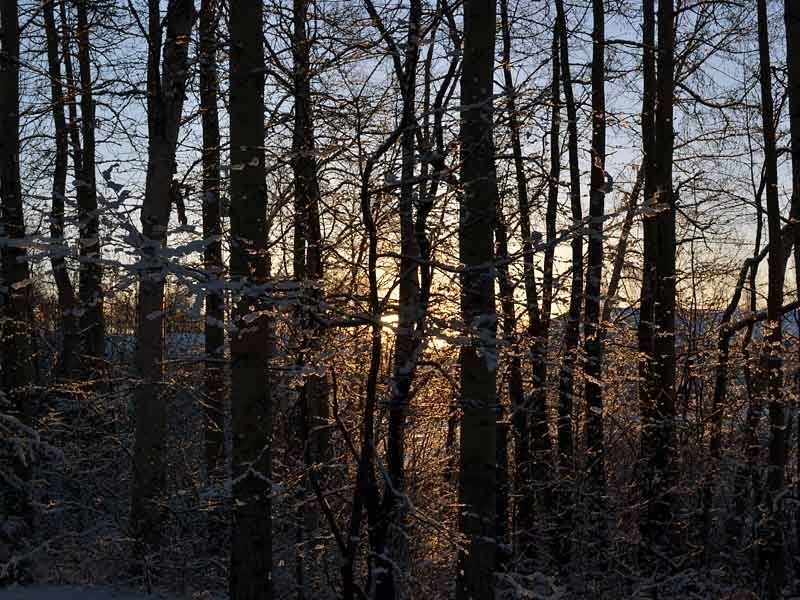 The snow clinging to the branches and the trunks of the trees holds a brilliant incandescent light, just briefly, until the sun's angle changes and the magic is gone. This one looks ... enchanted. Interesting thing here, I'm not sure if I prefer the cropped, closer version or the original for its grander sense of scale. Maybe the original... the other interesting thing is I wasn't certain if it was morning or evening. Beautiful light. Maybe I'd know better if I got up earlier. On taking a second look at the two images, I think the original has so much extra contrast between the yellow light and the surrounding blue light that I prefer it, too! Thanks for checking in and for your comments! Mavis, your ability to see beyond the camera's eye is amazing. This is definitely your medium. I love that you take it one more step, from a photograph to a piece of art. Thank you! I'm thrilled how the camera is a tool for making images, but also how it sets up a dialog between me looking at the landscape and me looking at the images I've made. I think it's really all about this back and forth. Glad you like what I'm doing! Multilogue -- then we look at it, too! :) Thank you for sharing the pix. A special window just for us!